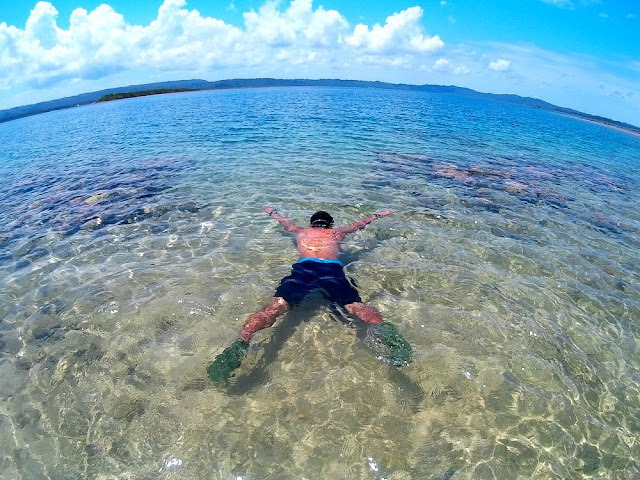 This particular seaweed or agar agar as others call it, is very much common in the coastal waters of Visayas and Mindanao. 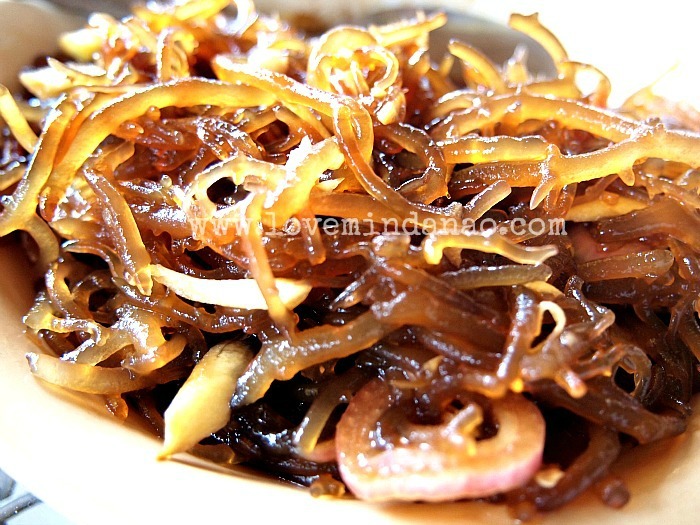 The only difference is that, instead of serving it fresh garnished with onion, tomatoes and vinegar, the Tawi Tawinians blanch the seaweeds then added with little soy sauce and some spices like ginger, onions , giving it a yellowish color. A simple roasted grated cassava as alternative for rice as chief source of carbohydrates. Since the islands are not blessed with much land to till for rice cultivation, the mountains are planted with cassava and sweet potatoes and other root crops as main source of energy among the locals. A cup wasn't enough for me to keep me off from the table , so another half maybe. Yum! Yum! Beware!This is the only dish that put my mouth on fire , almost literally. This must have been the spiciest dish I have ever tried. It was a patty of fish with tons of spices, mixed with beaten eggs, rolled in flour, then deep fried.I must have hated this dish as I forgot to take a good picture. 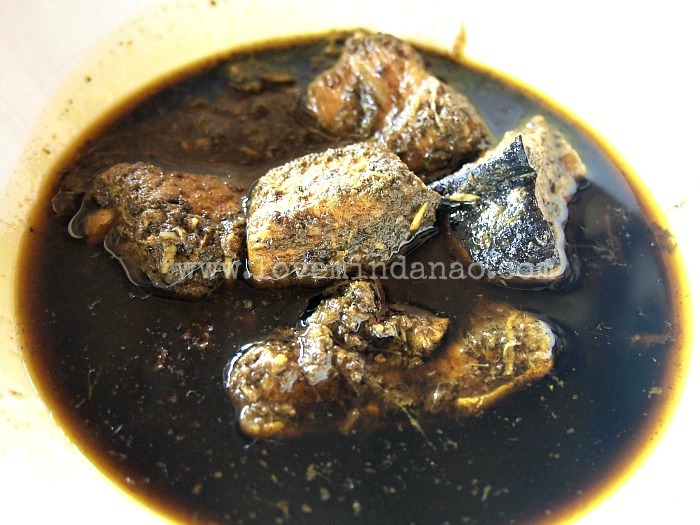 Tyula itum is somehow the 'Bulalo' equivalent of Tawi Tawi only it has a very spicy soup on it. 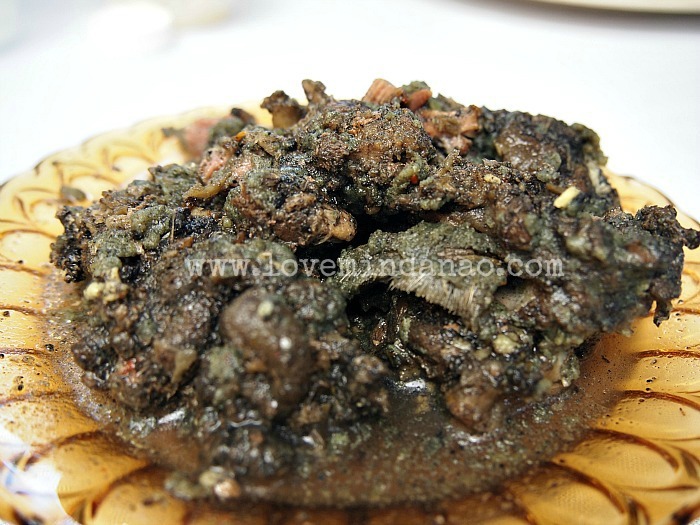 It is beef with broth mixed with burned grated coconut meat giving it a blackish color. It may not look appetizing for some , but it taste way better than your regular meal in town. Suggestion,you have to consume it while it is still warm as unsaturated fats or grease starts to form when temperature drops. Did I say this is their pride specialty? You can actually request for these dishes in your resort hotels but more expensive.These are much available in the common stores/carinderia particularly in Sukuran Street in Bongao with the prices given above.There are more to choose from but since I wasn't a big fan of very spicy food , I will forever stick with Syagul. Maybe soon or on my next visit after I have calibrated my taste bud , I will storm these stores and try everything on their menu. Chao! Looks like a traditional Filipino Paksiw na Isda (fish) but overloaded with tomatoes and spices. Looks like a chicken barbeque only black in color just like the Tyula itum, only dry. Is a native island made cookie rolled in a mixture of powdered milk and sugar. 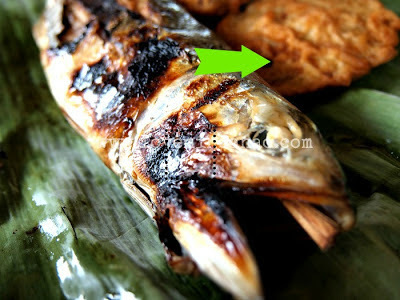 I actually see myself eating the Utak-Utak, as I love spicy food. Unless of course, I don't get an allergic reaction from that specific fish. Nonetheless, your food trip was so affordable! Looks really exotic but it would be nice to try it out. I once ate a cooked black spider in Cambodia and it tasted like a hairy squid. Torn between I would either taste it or just look and just capture it .. What would you recommend to have the best taste, and really a must try among all the recipes above? I love Mindanao and keep on writing everyday I appreciate the beauty of this place in our country that i still fear visiting besides Davao. This blog makes me hungry. I'm so happy to learn that we have these kinds of foods in the Philippines. Thanks for the tasty pictures! my mom knows those stuff.. I remember when she saw a photo of a stingray online and she said that it tastes awesome! Its exotic yet affordable contradicting to my first impression that anything exotic is expensive. I'll ask my mom if she had tried them on her last visit. I am very much amazed at the fact that though they can't till rice, they have a land that can produce crops that will supply their needs for carbohydrates. That's a living proof that in the Philippines, you will never go hungry if you are resourceful and industrious. I would love to have Syagul when I get there. Exotic nga ang foods but yung guso, familiar dish din sa province ng lolo ko. I like to try yung Syagul, basta may gata oks sa akin kahit spicy pa.
All are delectable food. 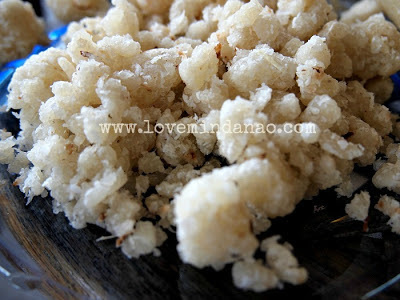 And the photos are great...nakakagutom tuloy. Super love the guso. I've never tried exotic food dishes talaga.. I don't think I can stand them. 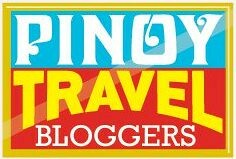 Pero maybe I can give it a try esp adter seeing the photos..
what a very cheap price.. I think this food is really perfect for inuman session. I've had guso, but I think the stingray looks really exotic! I don't know if it's available in Manila, but I am sure it would be very expensive here. Hmmm... Im very familiar with agar-agar and i like it. We also have that as Ilokano. But the others, i may have to think several times muna before eating them. Haha! Guso I'm very familiar with. The rest I don't know. I'm not familiar with these dishes, but I'd love to try this some time :) Hopefully I can visit Tawi-Tawi and immerse myself in their culture and cuisine.